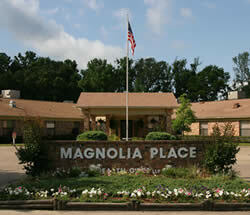 Welcome to Magnolia Place Health Care, L.L.P. Whether you need 24 hour-a-day nursing care on a long term basis or a Medicare rehabilitation stay, Magnolia Place Health Care, L.L.P. is here for you. Our licensed nursing personnel and trained staff are available to care for you. Our interdisciplinary team consists of members from nursing, social work, interfaith services, activities, rehabilitation and dietary to coordinate your individualized care plan. We also view the resident's family as a welcome and vital part of the care team. Magnolia Place Health Care, L.L.P. accepts Medicaid and Medicare, as well as private pay and long-term care insurance residents, and is licensed by the Texas Department of Human Services. Magnolia Place Health Care, L.L.P. is committed to caring for the whole person: physically, emotionally and spiritually. We have certified activity personnel, a licensed social worker, and numerous volunteers to support and enrich the lives of our residents. We invite you to visit our spacious facility and meet with our friendly staff to experience quality long term care. Contact Magnolia Place Health Care, L.L.P. Copyright © 2006 Magnolia Place Health Care, L.L.P. All Rights Reserved.